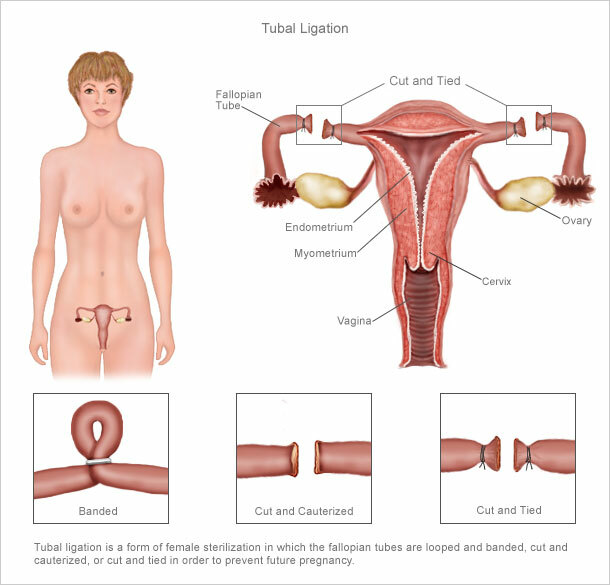 Having your tubes tied is medically known as tubal ligation, and it is basically a surgical procedure whereby the oviducts of a woman are cut, tied or blocked. Tubal ligation is a birth control method that is considered permanent. You should only go through with the procedure if you are certain you do not want to bear any children after because the chances of pregnancy after tubal ligation are quite slim. The oviducts offer passage for a woman’s eggs to the uterus where they await fertilization. Tubal ligation makes this impossible since the oviduct is either cut, tied or blocked. This way, no fertilization can occur. Tubal ligation is among the best birth control methods. That is 99 out of 100 women will never experience pregnancy after tubal ligation. However, there are rear cases where the oviduct(s) might grow back, especially if you went through the procedure when you were young. Tubal ligation is considered to be 99% successful as a birth control method. This means that there is a minority that gets an unplanned pregnancy after the surgery. Pregnancy is suspected to happen when the tubes grow and get reattached. This will happen after a year or more after the procedure. When these pregnancies occur, they are usually ectopic and not normal pregnancies. That is, implantation of the fertilized eggs is not in the uterine cavity but in the oviducts. An ectopic pregnancy is dangerous and must be dealt with as soon as it is discovered to get the woman out of harm’s way. If you feel as though you are pregnant after tubal ligation, consult your obstetrician as soon as possible. What Are the Chances of Normal Pregnancy After Tubal Ligation? The chances of getting pregnant after tubal ligation are very slim. Over a million women in the states have the procedure performed, and less than 1% are at risk of getting pregnant. If the clip method was used, then there’s a chance of pregnancy. The risk is also there for women who had their tubes blocked and did not go for follow up scans to ascertain that the barricade is still in place. This also applies to who went through with the procedure at an early age. Amber, posted her experience on 20th April, 2012 about her pregnancy after the tubal ligation. As of 30th August she was 11 weeks pregnant and her obstetrician/gynecologist, ran 2 separate tests on her to confirm the pregnancy. According to the results of the tests, her levels were steadily rising from 22.1 to 332.1 and they sky rocketed to 31,464. That was an indication that her pregnancy was healthy. Most women who get pregnant after tubal litigation have stagnant levels. The location of her baby was not visible until after 6 weeks and even then she only saw the gestational sac. A week later, she was able to see the heartbeat of her baby though it was very tiny. According to the experts in New Kids Center that in most cases it is possible to reverse tubal ligation, but it is best one doesn’t count on it. Tubal ligation reversals cost a lot of money and most insurance covers won’t cover the cost. Click HERE to read more about reversing a tubal ligation to get pregnant again.